That's not a typo: Amazon's latest Fire 7 tablet will set you back just £49.99. For that more-than-manageable outlay you're treated to a 7-inch 1020 x 600 display, 1.3GHz quad-core processor, 1GB of RAM, VGA front and 2MP rear cameras, and a microSD port. Amazon claims the battery is good for up to seven hours, including reading, movies and games. It also reckons its new Fire 7 slate is twice as durable as the iPad Air 2. 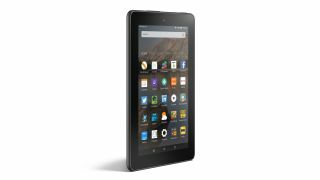 It runs Amazon's own, heavily modified version of Android, dubbed Fire OS, and all three new Fire tablets are running the latest version, Fire OS 5 'Bellini'. This gives you a very different look and feel on screen, with Amazon's own services thrust to the fore. The specs are far from the best on the market, but at this price point the new Fire 7 could still be quite a steal. As their names suggest, the new Fire HD 8 and Fire HD 10 tablets sport high-definition displays, and come with equally attractive price tags of £129.99 (for 8GB of storage) and £169.99 (for 16GB of storage) respectively. A 1.5GHz quad-core processor and 1GB of RAM sit at the heart of both slates, and both feature a 1280 x 800 resolution 5MP rear camera, HD front snapper and microSD slot. The resolution doesn't sound brilliant for either tablet, however, and it could be an indication of how Amazon has managed to keep the cost of its devices down. The 8-inch variant comes in black, magenta, blue and tangerine, while its 10-inch counterpart is only available in black or white. All three tablets will start shipping on September 30, with pre-orders open now.